Hey Friends! Hope everyone is having a great weekend! We have been non-stop since Thursday! We took a tiny bit of time away to take Walt for new sneakers, and some room decor...his room is a mix of Classic rock and reptiles! With a backdrop of Martha Stewart Wall color....Which reminds me...the other day in school his class was told that they could choose a new wall color for the classroom...Walt instantly suggests ..as he puts it.."The most perfect wall color on earth..Martha Stewart dried hydrangea"...lol. He is a riot! His teacher is used to the reptile & "room talk" by now. The kid is obsessed!..yeah yeah...thanks to us I am sure! I'll take the blame! I'll snap a pic or two next time I am over there! We have been working on about 5 different projects...website "stuff", custom orders, holiday orders, home "stuff", and a handpainted sign for our great friend's the Stasi family! We are doing a sign for their second home, which they have named "The Green Frog"....and yes...it is a green frog that we are painting! ...I'll post a pic as soon as it is finished! 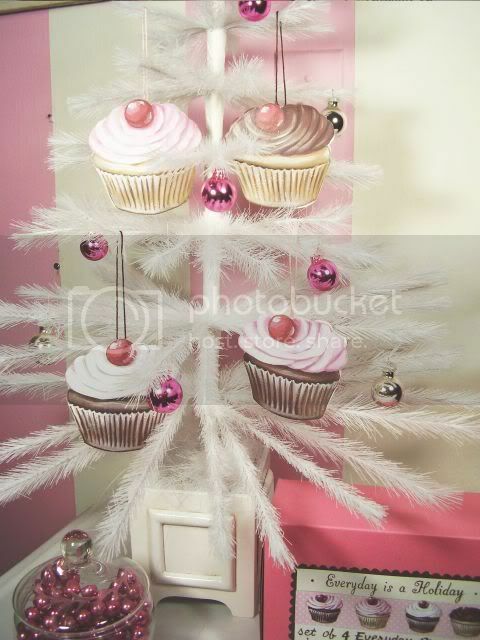 We are very happy to tell you that we have listed our brand new cupcake ornaments!! We are quite happy with how they turned out! We made a variety batch, mixing devils food and classic golden cake with creamy white, pink, & rich chocolate buttercream frosting. We decided to go with the retro style cherry toppers because more and more we've had requests to go a bit more 1950's style, and cherries just look so fab when glittered. All four cupcakes are fabulously glittered and backed with corresponding sepia toned vintage recipes. 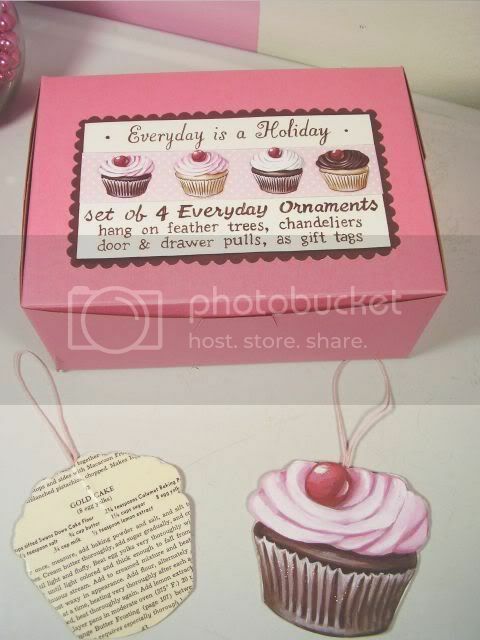 We have a set of Holiday cupcake ornaments coming very soon as well!! I have a handful of emails to return to some sweet sweet friends...I promise to find time tomorrow afternoon for you lovely ladies!! I hope to post a bunch of photos tomorrow as well! My vintage Christmas swap as promised!! Fabulous new cupcakes!! I LOOOOVVVEEE the cherry on top! Hi...I have to say: I want to eat up every single picture in your blog! So much pink! So much glitter! And CUPCAKES, too! With cherries on top! I've always said when I have my own brick and mortar shop, it'll smell like cotton candy, and I'll have pink-icinged cupcakes for all my guests. And of course, lots and lots of sparkle. Your blog is like my dream shop, in blog form.